To stay dry, warm and safe while keeping pack weight down, I looked for rain gear that will serve both in the rain, and on cold, windy days. To me, that means light, waterproof, breathable and comfortable enough to wear as a wind shell. Conventional wisdom is that one has to shell out something north of 200 clams to get into a well-constructed Gore Tex or eVent jacket. However, new, even more breathable fabrics are coming out, and those "old school" jackets made with Gore PacLite and even eVent are available at big discounts. We found a 13.5 oz women's REI Kimtah in eVent at REI marked down from 229 to 159. They didn't have a comparable men's version, so I turned to the intertubes. 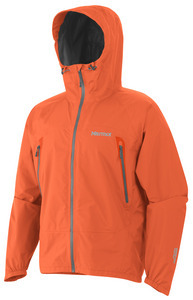 There I found an 8oz Marmot Nano in Gore PacLite at Campsaver.com, marked down from 250 to 163. We both found relatively inexpensive / somewhat breathable rain pants we'll carry during shoulder seasons. 'Course, new jackets will replace them in their former price points. Will I wish I had the new, state-of-the-art stuff? Sure, but I'll live with the "old" state-of-the-art stuff at 30-40% off ... That's a lotta pizza money! "Life isn't about waiting for the storms to pass, it's about learning to dance in the rain."